ZFS now offers triple-parity raidz3. Conceptually, raidz3 is an N+3 parity protection scheme. Today, there are few, if any, other implementations of triple parity protection, so when we say "raidz is similar to RAID-5" and "raidz2 is similar to RAID-6" there is no similar allusion for raidz3. I prefer to say "raidz3 is like raidz2 with one additional level of parity protection. But how much better is raidz3 than raidz2? 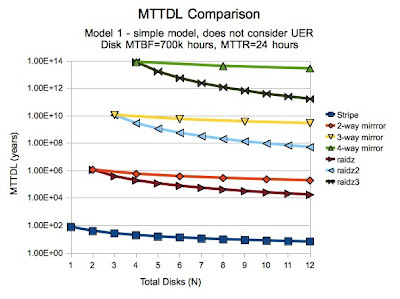 To help answer that question, I used the simple Mean Time to Data Loss (MTTDL) model to calculate the data retention capabilities of the possible configurations of 12 disks under ZFS. To be fair, the same model applies to other RAID implementations, but I'll use the ZFS terminology here. In this MTTDL model, the configuration includes N total disks. If the data protection scheme is raidz3, then the minimum N = 1 data disk + 3 parity disks = 4. You can add more data disks to increase the overall available space, so if N=6 then you have 3 data disks + 3 parity disks. The results are consistent with previous MTTDL analysis. 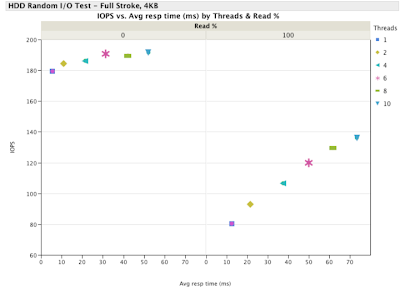 The 12-disk Stripe has an MTTDL of 6.7 years, which isn't very good (annualized rate = 15%) whereas the 12 disk 4-way stripe MTTDL is 2.75e+13 years (annualized rate = 3.63e-12%) and the 12 disk raidz3 MTTDL is 1.67e+11 years (annualized rate = 5.99e-10%). The theory behind raidz3 will allow more parity disks. But at some point, the system design will be dominated by common failures and not the failure of independent disks. I hope this model will be useful for you to evaluate the data retention of your storage system.